You are looking for the best you can buy in an air conditioner or furnace. A step up in design, technology and efficiency, saving you money as well as headaches. When purchasing a new air conditioning system, there are many factors to consider. A split-system home comfort system uses an outdoor (air conditioner or heat pump) and indoor (gas furnace, air handler or oil furnace) to deliver comfortable air to a living environment. Ruud Manufacturing has been a trusted name in the United States for many years. One of the world's leading manufacturers of central heating and cooling products, Ruud distributes its full line of residential and commercial products around the globe. 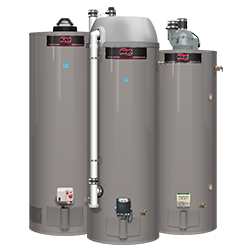 When purchasing a new heating, cooling or water heating system, there are many factors to consider. Whether you're looking to keep a workforce cool and productive, or need to ensure optimal conditions for heat-sensitive material, Ruud commercial air conditioners get the job done. 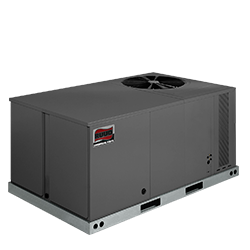 We offer a full range of state-of-the-art, high-efficiency cooling options – up to 25 tons. And many feature Scroll Compressors – the most advanced, most reliable compressors in the industry. One of the world's leading manufacturers of central heating and cooling products, Ruud distributes its full line of residential and commercial products around the globe.